He might well be surprised to find himself at the centre of so much attention, so many years later, in June 2019. He would surely have expected those about whom he wrote to be remembered rather then he himself. His life’s work was dedicated to preserving the history of Bradford, writing of those who played their own part in its development and the topography of the area surrounding the town. Whilst he personally hadn’t played a prominent part in the events of the day, he had been concerned with most of what had happened in the evolution of the city. Indeed he said that he had seen Bradford rebuilt in his lifetime and could recall when some of it, Hall Ings, was green fields. It’s quite possible that the family had once, many generations ago, lived in the village of Cudworth near Barnsley from which village they had taken their name. However, by the time William Cudworth was born, on 16th September 1830 to John and Ann Cudworth who were deemed to be poor but respectable and honest, the family had apparently moved to Wakefield. The 1851 census return would show William as being born in Bradford yet that of 1861 stated Wakefield. Certainly William was baptised in Bradford at Little Horton Lane Chapel. By 1841 the family were living in Portland Street in Bradford. William had three younger siblings by now – Ellen, George and Alfred. His father, John, was a printer and also well known as a deacon at Horton Lane Chapel. There was little time for schooling and William would have been only just ten, if that, when he was apprenticed, in 1842, to Mr William Byles, the proprietor of the Bradford Observer. William had found his vocation…..he took full advantage of the opportunities journalism gave him to witness public affairs and those involved in them. Interestingly he had, nearly all his life, been a great collector of newspaper cuttings which have proved invaluable to many people, especially local historians. In later years he would pay weekly visits to the villages surrounding Bradford and this lead to his first book Round about Bradford which was published in 1876. It took in forty two places within a radius of seven miles of Bradford. It was incredibly detailed and comment was passed in his obituary that much of what he had described had vanished in the past thirty years. His second book was called Historical Notes on the Bradford Corporation. This contained invaluable information about Bradford both before and after Incorporation, and it was of especial value for containing portraits of the mayors and other municipal officials. It was said to be the recognised authority for those wishing to know about such matters. A rather different book which he wrote was the Life and Correspondence of Abraham Sharp. He was a mathematician and astronomer, and assistant to Hamsteed, the first astronomer Royal. This was published in 1889, and it was said to be a monumental endeavour to do honour to one of the most distinguished scientists of his day, a native of Horton, Bradford. Mr Cudworth was fortunate enough to have the original correspondence which had passed between Hamsteed, Sharp, Halley and other astronomers of the period supplemented by his own researches at Greenwich Observatory and the library of the Royal Society. The work also contained accounts of contemporary families, with pedigrees, portraits and it attracted attention in the London Press and in various scientific journals. Conditions of the Industrial Classes of Bradford in 1887 which received grateful recognition from Mr Gladstone and Mr Giffen, statistician to the Board of Trade. In 1886 he published the first of a series of township histories. It was called Rambles Round Horton. A second volume concerned Bolton and Bowling and a third volume covered Manningham, Heaton and Allerton. In his obituary comment was made that his writing involved a vast amount of original research and it formed an invaluable resource for the future. He also wrote several articles for the Bradford Antiquary of which he was for many years editorial secretary. He gave lantern lectures showing his collection of views of Bradford before its transformation, These were published in an album during Queen Victoria’s Jubilee Year which coincided with the Jubilee of the Bradford Corporation. Mr Cudworth would give talks such as the one given at the Eccleshill Mechanic’ Institute in December 1892 when he delivered a lantern lecture on Old Bradford and Round About. John Maddocks Esq JP of Sir Titus Salt Bart Sons & Co of Saltaire praised his abilities as an antiquarian. He had come to appreciate Mr Cudworth’s abilities during his own term of office as Chairman of the Bradford Free Library and Museum. He was thoroughly worthy of the distinction of becoming a member. Sir Henry Mitchell JP and ex mayor of Bradford wrote that William Cudworth was known to him as a man of high literary ability and an enthusiastic antiquarian. Sir Francis Powell Sharp Bart MP of Horton Old Hall had no hesitation in saying that William Cudworth had eminent claims for admission to the Society from his diligent studies and original investigations and also from the books he had published, including the Life of Abraham Sharp the astronomer, and historical descriptions of Bradford and others in the immediate neighbourhood. In Late April 1892 Mr Cudworth completed a connection of fifty years with the Bradford Observer and celebrations were held to mark the occasion. These were the subscribers whohad donated towards the cheque and some, especially the Mayor and his fellow councillors, had their donations listed in a programme printed to record the event. The parlour table was decorated with bouquets sent as a jubilee tribute from the managers of the five public parks in Bradford. A fine collection of orchids was also sent by Messrs Charlesworth, Shuttleworth & Co of the Orchidry in Heaton. Mr Butler Ward made a speech saying that when it became known that Mr Cudworth would be attaining his jubilee in connection with his literary work in Bradford, a few friends got together to find some way of recognising the event. The presentation was made by the Mayor, Mr Thomas Priestley. Whilst acknowledging Mr Cudworth’s impartiality and accuracy as a member of the press, he went on to say that on this occasion they were more interested in the work he had done of a historical and biographical nature. Mention was then made of the various books written by Mr Cudworth, praising his original research and commenting that his Notes of the Corporation which was now the recognised authority on that subject. The Mayor, Thomas Priestley, then made the presentation. He said he hoped Mr Cudworth would be long spared to enjoy the esteem in which he was held. Mr Suddards spoke of the hearty and unselfish work done by Mr Cudworth for the Bradford Historical and Antiquarian Society. Mr John Maddocks praised Mr Cudworth’s interesting and valuable local history, inspired by the love of the place in which he was born. Then came Mr Cudworth’s response. He was almost overwhelmed with the kindness which had been shown to him that afternoon. He wished to express his thanks for the great honour which had been done him. He thought it very unusual for a person to remain with the same employer for such a long period. A period for him which had been most amicable with not a single cross word. The watch with which he had been presented would be amongst his most treasure possessions and it would remind him of the generous deed done to him that day. He went on to say how his literary work was inspired and stimulated by that love of home and that feeling of loyalty to his native town which he wanted to commend to younger men. He had a great desire for the prosperity of old Bradford. In the last fifty years the social and industrial life of the town had gone through many phases, and the trade through periods of adversity and prosperity. He felt the latter had outweighed the former. He did though recall distress of the severity of which the present generation could have no concept. He remembered men patrolling the streets and drawing plugs from the boilers, and congregating for the manufacture of pikes and bludgeons and the casting of bullets. Those were not the days to which one would want to return and he thought they were gone for good. Mr Cudworth then referred to some of the improvements made in Bradford and reminisced about bygone days. He concluded with once again expressing his thanks for the gift which had been made to him. The above details were taken from a lengthy newspaper article in the Bradford Archives. On 30th April 1892 a dinner was held at the Alexandra Hotel to celebrate William Cudworth’s fifty years connection with the Bradford Observer. The editor Mr WP Byles presided over the occasion. Mr Cudworth’s health was proposed by Mr W Harrison who also had a long association with the newspaper. He spoke of Mr Cudworth’s qualities of industry, thoroughness and patience in research and singleness of purpose which had led to his success as a journalist and local historian. * an ornamental centrepiece for a dining table, typically used for holding flowers or fruit. William Cudworth died aged 75 on 20th March 1906. His obituary in the Sheffield Daily Telegraph described him as the oldest Bradford journalist. He was buried in Undercliffe Cemetery, in the company of many of those whose lives he had immortalised in his book Historical Notes on the Bradford Corporation. By 1861 William and Margaret lived at Denton Hill Cottage, 19, Killinghall Road in Eccleshill. Clara, Arthur, Lucy and Jane. Another ten years saw the birth of Frank, Ernest, Emily and Alice. In 1871 the Cudworths lived at Belgrave Street in Manningham. In 1879 a most grievous blow befell the family. Frank Cudworth, aged only 16, was an apprentice with Charles Mills & Co, upholsterers. One Wednesday afternoon he was assisting a sawyer called John Pratt to pile up some boards near the shafting in the cellar. Pratt told him not to pile the boards too high, as enough space should be left for the belt on the drum to be thrown on and off. Frank apparently said ” Oh, it’s all right, there is plenty of room, ” . In about half a minute the belt broke, and on turning round Pratt saw Frank being whirled around the shafting. Pratt shouted to turn off the engine, lifted Frank from the shafting and helped take him to the Infirmary. It was to no avail. Frank died at half past five that same afternoon. The jury returned a verdict of Accidental Death and recommended that the shaftings, drum and belts in the cellar, should be properly protected. 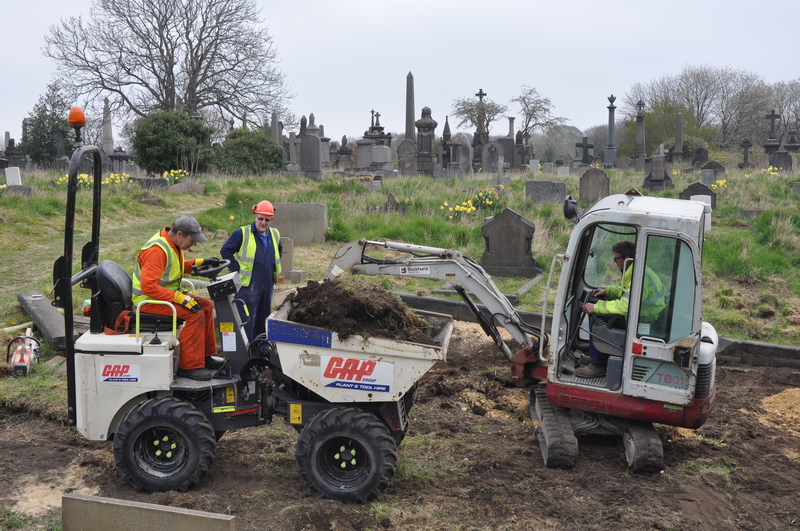 Frank Cudworth became the first of the immediate family to be buried in Undercliffe Cemetery. By the time of the 1881 census they had moved to 167, Undercliffe Street Bradford. For the first time, at the age of fifty, William gave his occupation as that of journalist rather than compositor. In 1882 Dr Maffey who had been secretary and Vice President of the Bradford Historical and Antiquarian Society was presented with an illuminated address to thank him for all he had done as he prepared to leave Bradford for Melbourne, Australia. A report of the meeting appeared in the ……and mention was made that William Cudworth was going across the sea in company with Dr Maffey. He hoped it would be the means of restoring him to health. Dr Maffey remarked that he hoped he should be able to send back Mr Cudworth to them in renewed health and vigour. He felt certain that that gentleman would derive great benefit from the change. It may well be that he had not recovered from the dreadful shock of Frank’s death. When Mr Cudworth sailed to Australia in 1883 he made notes on the voyage which are available to read in the Bradford Archives. The outward voyage took three months and five days and the return journey just four months. He later wrote a paper about his voyage. In his opening remarks he commented that sailing to Australia was the most enjoyable of all holiday excursions provided one was a fair sailor and had made up one’s mind to a state of existence altogether to life on shore. The 1891 census showed William was a newspaper journalist, surrounded by his family, including his grandson Oscar Silverwood aged four – his daughter Clara had married John Henry Silverwood in 1876 and would eventually have thirteen children, one of whom would die in the First World War. By 1901 William had retired. He was living with Margaret in Little Horton Lane, Sawrey Place, together with two of his daughters, Jane and Alice and Oscar now 14. He was buried in Undercliffe Cemetery. As mentioned, William and Margaret Cudworth had eight children. She married John Henry Silverwood. They had had 13 children by the time of the 1911 census. Two had already died and a third, Alan Silverwood, died aged 21 on 11th November 1917. He was buried in a military cemetery in Belgium. Like his father, he was a journalist, though in Sunderland rather than Bradford. He was married to Matilda and they had four children. Arthur died aged 46 in 1903. According to his obituary in the Newcastle Evening Chronicle ( 14th May 1903 ) Arthur’s early years were spent in the woollen industry but eventually he had become connected with the press and for some time was a member of the staff of The Darlington and Stockton Times. Later he joined the Sunderland Press. More recently though his health failed him, he was confined to bed for some time, and he died at his residence, 11, Hylton Road, Millfield. He was an able and versatile journalist. 7. Emily Cudworth 1866 – ?? She was still alive in 1946 when she was appointed to deal with the estate of her sister, Alice Carter. Nearly twenty years after her father’s death, she married James Carter when she was 54. So, of his eight children, three of his four daughters had no children and nor did two of his sons.